As refreshing as a tall glass of fresh lemonade on a hot summer day, this delightful mix of bright yellow, orange and green blossoms is sure to make a splash! This arrangement makes the perfect anniversary, just because, or birthday bouquet of flowers. Contact Four Seasons Flowers today for fresh-flower deliveries in San Diego! 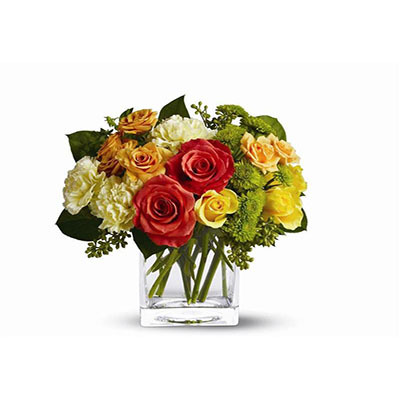 Yellow and orange roses and carnations are delightfully arranged with brilliant green mums and assorted fresh greens.